This piece was originally written in May of 2009. It is a question I think and write about often. 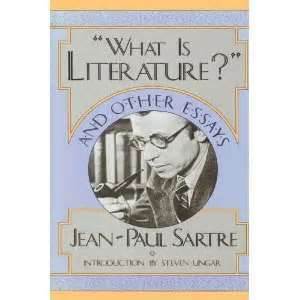 I read bits and pieces of “What is Literature and Other Essays” by Jean Paul Sartre. In it, he poses the questions “Why does one write and for whom does one write”? I booked-marked that section and have returned to it time and time again. I began writing from an early age as evidenced from my childhood journals. I don’t have a lot of relics from my childhood; a few stuffed animals, pictures, trophies, baseball cards, and one dress. In addition to that lot, I also have just about everything I ever wrote from 3rd grade on up. I want to believe my mother sensed I had special talent and that is why I am able to rummage through my old ramblings. Writing was a major form of communication. As a child, I often felt unable to speak or express myself; a trait I inherited from my father’s side of the family. We are a very close-knit, yet distant family – if that makes sense; very few hugs, very few displays of affection, and feelings that were often repressed. Writing became a way for me to speak, express, and to feel. Currently, I struggle to say exactly what is on my mind unless I’m extremely mad, but when I write, my words are bursting with clarity and colorful emotions. Other than the teachers who read my class assignments, I never had an audience in mind for my writing. As a teenager, I often wrote rebellious entries in my diary. Although one hopes their parents never read their diary, certain pieces of the diary serve as an open, un-communicated letter to your parents. So, my parents were my unofficial audience. As I got older, I received praise for my writing and realized how much I enjoyed writing. I considered writing seriously for the first time whilst in college as I submitted a few (perhaps one or two) articles for the school newspaper. I had never dreamed of being an author, journalist, or serious writing. I was studying Business Administration and Arabic – not journalism or anything related to writing. As I fast forward to 2013, my writings continue to encapsulate my feelings, but I also have taken on small research projects, book reviews, public service announcements, and most importantly, my writing serves to capture history. A picture may say a thousand words, but a sentence adds a bit more. I may forget the day I took a certain picture, but a caption brings it back almost immediately. As I read through my blogs about my different travels, I am immediately taken back to that time and place. I don’t write for fame nor money, but I do feel rewarded when someone thinks I have something interesting to say or someone reads and comments on one of my posts. While I’m envious at some of my counterparts who can crunch out books and blog posts faster than I can a 3-5 paragraphs, I have to remind myself of Sartre’s question: why do I write and for whom? When I write, it’s a reflective and soul bearing process, one in which takes time. I want to write for individuals who are more than one-dimensional, open, and want to go on a journey – even if it’s not one they would not take on their own. So now it’s time for your homework: Why do you Write? and who is your audience? Actually I don’t write – unless for work :-0. I often feel the need to purchase a journal to write but with no purpose then maybe future generations knowing a little more about their great grandmother :-).